We are able to offer discounts on orders of 1/2 or whole lambs and pigs and hind quarters of beef packed for your freezers and to your requirements. 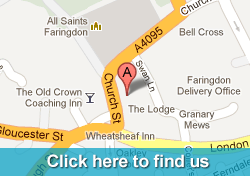 We are a traditional butchers shop and all cuts of meat are readily available due to the way we source our meat. It also means we are happy to help whether you are looking for everyday meat like chicken, mince or chops or decorative joints for that special dinner. All of our sausages, burgers and meatballs are freshly made at the shop which ensures we are able to control the quality of the ingredients. We look forward to welcoming you to our shop, which is situated in Faringdon’s picturesque Market Place just before the historical All Saints church. Alternatively you can click here to place an order online, or call us on 01367 240551 and speak to Peter or Tara who are always happy to help. 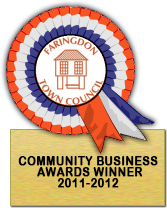 We are very proud winners of the Faringdon Chamber of Commerce Community Business Award for 2011-2012!